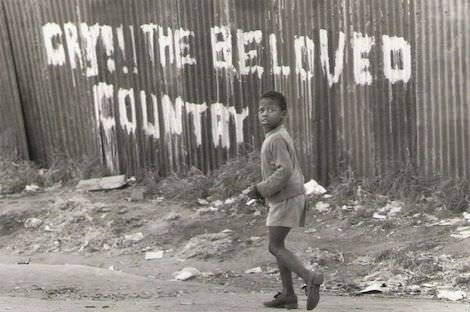 Seventy years ago Alan Paton wrote Cry the Beloved Country. His novel opened many Australians’ eyes to the wounded South Africa that lay behind its colonial surface. His elegiac conclusion was prescient of the two generations that followed. What lay ahead was 50 years in which fear built fences between races, hammered laws into trenches to trap transgressors, locked freedom behind armour plate. Fear made people focus on the possessions they could lose and blinded them to the possibilities of the world in which they lived and the graciousness of the peoples with which they shared it. They lived encaged. The brave who had stood silent in the flaring sunset, tried to open the eyes of their people. Writers represented their world but it was not recognised. Critics denounced the injustice, and they were exiled. Thinkers proposed better policies and they were ignored. Generous people were compassionate and they were mocked. Insurgents rose in protest and they were jailed. The darkness put out the light for longer than their lifespan. And yet they persisted. This week is 103rd World Week of Migrants and Refugees (21-27 August). It focuses on refugee children around the world. In Australia, as elsewhere in the world, fear rules just as it did in South Africa. We have sent ships to push them back, dumped them on remote islands, imprisoned and neglected them, shaped laws to beat them with, made compassion criminal, and caricatured their religions. And the fortress of fear keeps strengthening its battlements. Over the last 40 years many Australians have visited, fed and clothed refugees, dreamed of a more welcoming society, proposed better policies, come together in marches, and collected alms. Year by year brief periods of sunshine have been followed by heavier storm. "The treatment of refugees has become more brutal, their sufferings have grown and their protection under the rule of law has been shredded." The treatment of refugees has become more brutal, their sufferings have grown and their protection under the rule of law has been shredded. Internationally, refugee organisations, founded in the hope of soon being redundant, now face an avalanche of refugees. Nations that once offered hospitality to refugees are now investing their resources in exacerbating the conflicts that produce refugees. Fear has made a desert. In such times it is easy to cede the struggle, give in to fear. The South African experience encourages endurance beyond one’s lifetime. So does the annual Migrant and Refugee Week. It invites us to attend to the small fidelities of visiting, caring for and respecting refugees, remembering the lives that fear has scarred, and calling for a better way. It invites us also to dream of a world where people can laugh, stand silently, be moved and give their hearts, free from fear. It is no accident that in such a fearful world for refugees Pope Francis, like Alan Paton, focuses on vulnerable children. His appeal is practical. I ask everyone to take care of the young, who in a threefold way are defenceless: they are children, they are foreigners, and they have no means to protect themselves. I ask everyone to help those who, for various reasons, are forced to live far from their homeland and are separated from their families. To see the world freshly through the eyes of children, before they have learned to fear, enables us to smell the foetid world that fear has built. It enlivens us to work that refugee children, foreign and unprotected, may find a world in which they can play unafraid. Children make a nonsense of exceptionless rules, locked gates, detention centres, watertight policies, the brassy monuments that fear builds. They have a right to give their whole heart to mountains and valleys where they may freely roam. They mark out our task: to move our nation from fear to hospitality. If you want to create a new concept called 'economic refugee', by all means argue for popular consent for it and change the migration laws accordingly. However, as the current rules say that a refugee is a person fleeing political persecution, shoehorning 'economic refugees' into a category that does not describe them is not serving truth. The difference between apartheid South Africa and Australia is the difference between accommodating a finite number of fellow citizens with some multiple of five loaves and two fish and accommodating an infinite number of foreigners with the same multiple. Australia has rightly been condemned for it's lack of human rights for the asylum seekers who have been sent to off-shore 'hell holes' for over 4 years now. Seven have already died and they are all now psychologically damaged for life. The Coalition and Labor are playing politics with the lives of desperate people. The boats have stopped. Our political leaders should both acknowledge the cruelty of this incompassionate biparstisan policy, and bring these desperate people to Australia. Roy, would you care to expand on the final sentence of your 21 August message because I find the loaves and fishes stuff and the infinite number of foreigners hard to follow. Simple words for a simple fellow please. I thought apartheid South Africa was about maintaining a privileged minority in economic, political and social power and control at the expense of the majority of the population for as long as possible, until internal and external pressures forced the inevitable change. Am I wrong? According to some respected contemporary commentators in South Africa the future of that country is not looking rosy and they fear it might be breaking down. Refugees normally come from nations which are breaking down in some way or other. I believe famine and war are causing many Africans to seek a better life elsewhere. Sadly, Europe, where most of them are/were bound, is stretched to the limit in taking and absorbing them. Their sheer numbers can be seen as a mass migration. What now? I think the most effective action would be to attempt to assist them in their countries of origin so they don't have to migrate and be unwanted refugees. I remember seeing on the 7.30 Report on the ABC, a piece about a talented young Syriac Christian refugee in the Lebanon, who, with his family, had applied to come here as refugees and were rejected. Why was not explained. He still has relatives who have remained behind in Syria. Could he return there? Finland did accept some Middle Eastern refugees who, when it was deemed safe for them to return to their countries of origin, were returned. This is a technically insuperable problem. We certainly need to treat refugees better and the offshore solution is barbaric. Where to now? Brett.. Apartheid was much more than a system to maintain a privileged minority in economic privilege and enforce the delusion of white supremacy. It has its origins in the fundamentalist, Calvinist interpretation of the Old Testament account in Genesis. Gain was exiled from the Garden of Eden for murdering his brother Abel. He is the earliest recorded Middle Eastern refugee who settled in North Africa in the Land of Nod. The people of the tribe established in Nod were Black and were considered to be the labourers, slaves or servants of others, the retributive punishment for Cain's murderous activity. The white Calvinists of South Africa considered all blacks inferior in the eyes of their God as remnants or descendants of the tribe of Nod established by Cain. Over the millennia, belief has been the greatest destroyer of Humanity and Apartheid is one of the best examples of the poison of fundamentalist interpretation of "the word of God". I would have thought the New Testament is the scripture that should have the major influence as "the word of God" rather than the metaphorical ancients' fanciful explanations of the world around them. It wasn't beyond Jesus of Nazareth to criticise the interpretations of the scriptures by the people of his time. Beautifully written Andy. Thank you for reminding us to view this desperate situation through the eyes of children, the most innocent and vulnerable yet our best hope and means of seeing a way through the worldwide dilemma of displaced people. It is sad but true that, "The treatment of refugees has become more brutal, their sufferings have grown and their protection under the rule of law has been shredded." These are dark days for those of us who value compassion and love. Thank you, Andrew, for such a timely and truthful article. Andrew, Thanks for your powerful, poetic and loving insights into an ongoing crime, sin and shameful disregard for the lives of those who claim the same humanity, breathe the same air and bleed through the same veins as do we. I remember Robert Kennedy's "every time someone stands up for an ideal, strikes out against an injustice "
The Royal Commission into Institutional Responses to Child Sexual Abuse has published a 2000-page three volume Criminal Justice Report. One of its recommendations is that the states and territories 'create a criminal offence of failure to report targeted at child sexual abuse in an institutional context'. We students go to school to learn. But one of the best learning experiences for me has happened outside school: helping the less fortunate by serving them food at the Sacred Heart Mission and collecting food necessities for the charity.